As we described in a previous post, the means test for prospective Illinois bankruptcy petitioners was recently increased, as were other dollar amounts in the U.S. Bankruptcy Code, which will affect all those filing for bankruptcy on or after April 1, 2016. Read on to learn more about how means testing works for those filing for personal bankruptcy in Illinois, and speak with an experienced Illinois bankruptcy attorney to help you decide which bankruptcy chapter would best suit your needs. The U.S. Bankruptcy Court uses ten-year census data, as well as measures of inflation and changes to the cost of living, to calculate the median annual income for each state. This number becomes the initial threshold to determine whether an individual or family qualifies for Chapter 7 bankruptcy, with those making less than the average automatically qualifying to file under Chapter 7, and those making more needing to either file under Chapter 13 or take additional steps if they still wish to try and qualify to file under Chapter 7. As of April 1, 2016, the median income for an Illinois bankruptcy petitioner filing as an individual has been set at $49,741, with the threshold set at $63,896 for a family of two. For those who still wish to qualify to file under Chapter 7 but have a greater annual income, the next step is to complete a form that compares your income and allowable expenses to arrive at what disposable income remains that could be made available to pay your debts. This is slightly less straightforward than it seems, as “allowable expenses” can include amounts you have actually spent on certain permissible costs, but also amounts that are set by federal or local law. 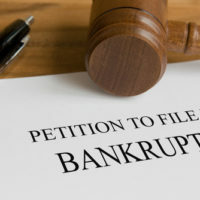 Filing for bankruptcy under Chapter 7 and Chapter 13 will have a very different impact on a petitioner, though there are advantages and disadvantages to each. Chapter 7 bankruptcies will impact the petitioner’s credit for a longer period of time than will Chapter 13 bankruptcies, but will often result in greater debt forgiveness than will Chapter 13 bankruptcies. Those who qualify to file under Chapter 7 may find it worthwhile to consider nevertheless choosing to file under Chapter 13. For those meeting the means test under Chapter 7 but filing under Chapter 13, the bankruptcy court will require that petitioner to make payments under the court-mandated payment schedule for only three years, rather than the standard five years that applies to Chapter 13 petitioners who do not meet this test. An attorney can help walk you through the process of choosing which form of bankruptcy would be best for you. If you are considering filing for bankruptcy in Illinois, speak with experienced and knowledgeable attorneys about how best to promote your long-term financial best interests by contacting the Carol Stream bankruptcy attorneys at Johnson, Westra, Broecker, Whittaker & Newitt for a consultation, at 630-665-9600.